Before you jump into our Final Fantasy XV (FFXV) survival guide, you should master the entry into the game. It is important that you complete the tutorial. Especially the combat system, which is supplemented by an action component and you have to master that first. The most important tip here: Go first in the options of the game and set the combat mode to wait. With this attitude, the battle stops whenever you don’t move and give no commands. This gives you plenty of time to think about the next steps. You can move the camera to different positions, cast spells and even change the combat tactics of your group members. Explore the world first and get an overview of the possibilities that Final Fantasy 15 offers you. So you should not jump from mission to mission, but use the time in between to master optional tasks and collect rewards. In addition, the world offers you all sorts of resources that you can find and use wisely. Noctis has a stamina bar, which you can activate or deactivate in the options above its head. Especially at the beginning the bar is helpful, but later in the game you will quickly see through the movements of Noctis, when his stamina is consumed. If this is the case, he can not sprint anymore and must take a short breath. Tip For Infinite Stamina: This tip requires a little practice, but when used correctly can mean infinite stamina for Noctis. Just before the stamina bar runs out, you should use the Sprint button (circle on the PS4 and B on Xbox One) and then press it again immediately. With the right timing, the bar immediately fills up for your stamina. - Noctis can climb on rocks and also climb high in open terrain. However, keep in mind, that you are not immortal, and a case of certain height causes harm. 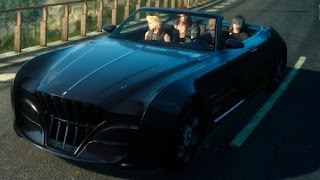 - After you have been introduced to the game world, you get the Regalia. This is the name of the car you are traveling with. Here you can decide whether you want to drive or leave a buddy to the wheel. However, the latter goes only when it is not at night. As soon as it is dark, you have to drive. Drive another one from the group, but you can change at any time and steer manually. Always keep the tank indicator in the eye. If the gasoline is running out, you have to push the Regalia to the nearest petrol station or you have to walk. If you have already seen a place, you can go directly there. This time savings also costs you something. - If you pass by shimmering objects, these are valuable things that you can sell at merchants. It can also be ingredients for a meal that Ignis prepared for you when camping. They have certain effects and can give you bonuses. Also look for elemental sources and collection points that will reward you with special items you can sell for Gil (currency in FF XV). - HPs are the health points that sink when a character takes damage. If the bar sinks too much, the maximum is attacked and falls constantly. Now you should use a healing object or have a friend help you. If you want to increase the maximum again, you must either take a break or use expensive healing items. - MPs are magic points that have only Noctis. This can cast spells. Each of them empties this bar a little. If it is completely empty, it fills slowly again. - Look at the evasion and parrying. Especially the latter is often asked you in boss battles. The role can almost always be used and can save you from big damage. - Noctis can use warp attacks to escape from an enemy and attack again. But keep in mind that these attacks cost MP. - Also experiment a little with the spells. You can mix different objects and use them later in combat. If you have now set the combat setting on hold, you can select a magic bottle. - At the beginning you can use the scan feature, which can run Noctis in the waiting mode. So you see what strengths and weaknesses your opponents have.